The neutrals are in and here to stay everyone! Tonight's look focuses on how to take the neutral trend and make it work for you. So, normally I try to avoid neutrals or lighter shades because my skin is so pale, but this year I've just decided to embrace it. If you have a more fair skin tone, I suggest adding a pop of color somewhere so you don't completely wash yourself out. One way to add color is through your accessories. I feel like gold brightens your skin more than silver so for this look I selected a gold statement necklace. It also features a light pink tone in the feathers so that also helps with color. 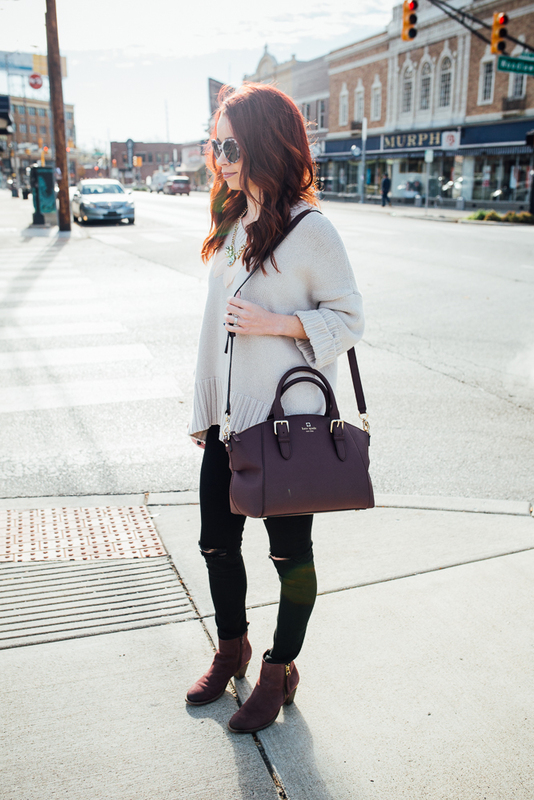 My "mulled wine" Kate Space bag and Steve Madden booties also liven up this neutral sweater. It's always a good day when my bag matches my shoes because it doesn't happen very often. I love this bag though because it quite literally goes with everything. Kate Spade is my girl and I love her surprise sales. I always suggest black pants with a neutral top. That may totally be a personal preference, but I feel like it gives the look kind of an elevated update compared to jeans. The pair that I am wearing are no longer on sale at Nordstrom (sad face), but there are so many black pant options out there. I also love Express for bottoms. One last note, I am usually a label whore when it comes to sunglasses, but I found these on sale at Loft and I am kind of obsessed. Just goes to show you don't have to spend hundreds of dollars on one accessory. Plus, I will feel a little less bad if I happen to lose these or drop them in a lake.... yep that happened once. RIP Marc Jacobs sunnies. What the Holidays are really about.